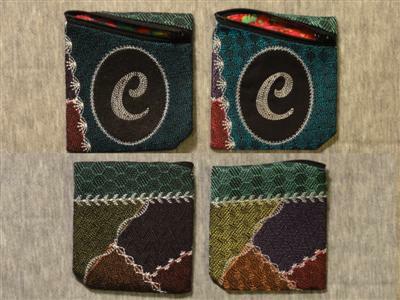 Crazy Patch and Cathedral Windows Zip-Around Pouches -- New! Do you remember the Parquet Tile motif fills I used in my kaleidocycles? decide which fill to use. 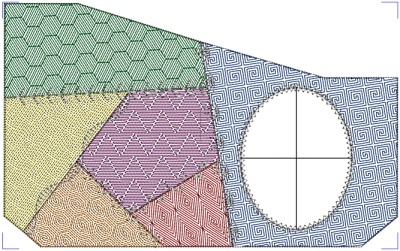 leaving open space between the design and the outline around the oval. they are made of the same thread. include it in my collection. 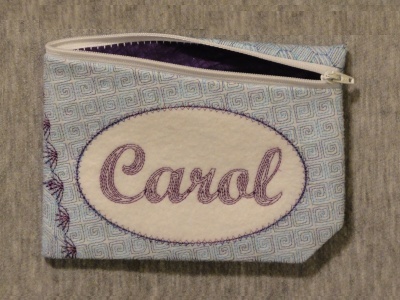 the pouch front. 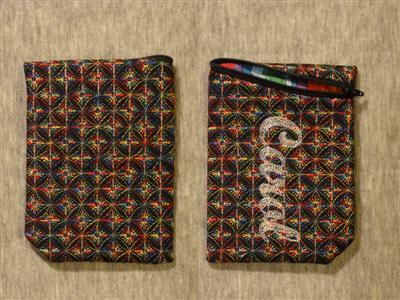 Open the pouch design first, then add your name, initial, or other design. 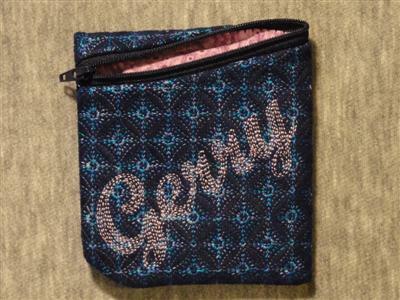 Position your design, using the centering lines as a guide, and then combine embroideries. 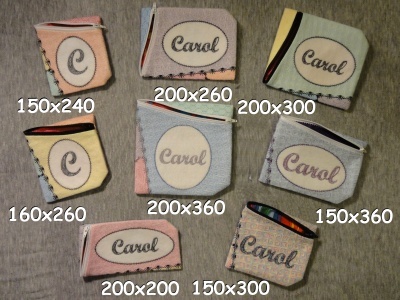 I digitized pouch designs for 8 hoop sizes, ranging from 150 x 240 mm to 200 x 360 mm. choose the size from the drop down menu on the right side of the screen. Here is a picture of all the sizes. largest, so there will be more of that favorite color to enjoy. variegated thread for the embellishment but may do that one day. When I first started playing with these designs, I stitched my pouches on felt. That fabric stitches really well and gives the pouch enough body that no fleece is needed. you see how much brighter the stitching looks on poplin? on the front of the pouch. these are great!! Where can I find your fonts? The font is called Contour Script. It will be available here very soon. Watch this blog for an update on all my alphabets. See my photo gallery here for photos of that alphabet and my others, too. I have been searching for your fonts for a while now and have not been able to find them. I love your jumble fun font also. I hope these will be available also. I like the use of the oval too. I think it makes the name/letter stand out more. You have great detailed instructions. 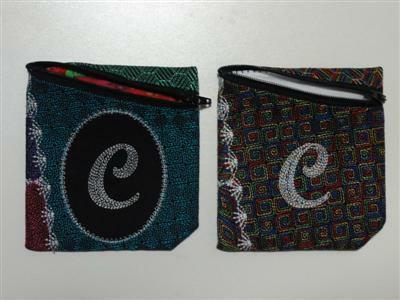 I ordered the complete set of zippered pouches, but did not receive directions, would you please send the the written instructions with pictures? Thank you for the kind words about my instructions. That means a lot to me. The Fancy Jumbles alphabets are available now and the Contour Script and Contour Print alphabets will be added soon. Check my Packs page for availability. The instructions should have been included with your purchases. I will look into this and make sure the instructions are included with all purchases or emailed separately. Have you received the instructions for the design set you ordered? I reported the problem to the techs at Ann the Gran so they could take care of it. They asked me to check with you, so please let me know either way. Yes, I received your instructions. Thank you so much. Contour Script and Contour Print are both available now. Go to http://www.annthegran.com/brw/Packs.aspx%C2%A0">www.annthegran.com/.../Packs.aspx%C2%A0 and click the Carol Brown link. I am glad to hear that you received the pouch instructions. They have now been emailed to everyone who purchased the designs. If you are missing your instructions, please let me know.